Sheena pty ltd trades as X-packaging and Sheena Cleaning Supplies. X-packaging is a contract manufacturer of liquid detergents and specialty cleaning products as well as horticultural chemical products. In addition, X-packaging provides client services for contract blending & filling as well as product formulation / development, manufacturing, quality management and risk management systems. Sheena Cleaning Supplies are distributors for cleaning products primarily manufactured by X-packaging. The company was registered and commenced manufacture and sales in 1992. It was primarily started as a private label contract manufacturer. The primary factory unit is situated in the industrial sector of the northern Perth suburb of Wangara and is part of a well maintained and landscaped property. The factory floor area is about 350 sq. metres with an office, production and storage area. In addition, a second factory unit of a similar floor area in Wangara, 2 minutes from the primary factory premises has been aquired to cater for the increased demand for manufacturing and storage facilities. Both units conform to EPA, Water Authority and Shire requirements. The company is primarily a contract manufacturer of liquid products, and also provides services for contract filling, product blending, product development and contract manufacture for its clients The production facility has the capability to fill liquid product into containers ranging from 150 ml to 200l drums and 1000 L IBC’s if required. 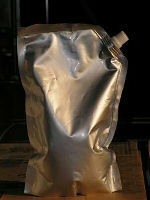 In addition to liquid packaging, the company also produces wipes of varoius types in flip top cannisters and is in the process of aquiring a stand up pouch filling facility. 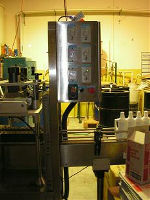 Currently, the company already has several automatic filling machines capable of filling product upto 5 litres as well as semi automatic fillers that will fill to 200 L. In addition, there is also labelling facilities for both round bottles and double sided labelling of containers and flat sided square containers. Due to the demand, the company is moving into packaging of solid granular products into small pack containers and bags upto 5 kgs in weight. This will be expanded into larger pack sizes in the near future. In terms of liquid production and filling, the installed capacity is about 33% utilised. The owners pride themselves on their individual expertise in Technical, Chemical Engineering and Risk Management on one hand and Marketing Management on the other. With a track record of over 70 years experience between them within the detergents, mineral processing, agrichemical and building products industry, the company can offer services, consultancy, risk mangaement and assessment as well as product development over a broard spectrum of areas , all of which are to a very high standard.